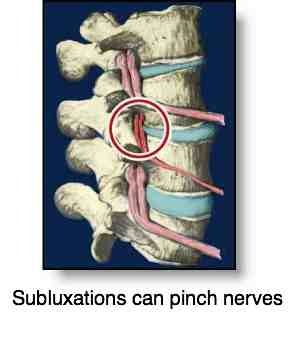 Chiropractic subluxation is an evaluation of the use of terminology. The concept of a chiropractic subluxation between two vertebrae has been one of the fundamental components of the profession's theories since its founding in 1895. Today it might be called a spinal fixation, but really hypermobile segments should also be included in the definition of the chiropractic subluxation. Today, the term is understood to be an area of hypomobility, or reduced movement. It's often simply called a spinal fixation. Measurable degenerative changes occur in the cartilage in the joint within 13 hours of subluxation. Within 1 week proteoglycan loss can be detected. These chemicals enable joint cartilage to retain water and collagen to remain elastic. These progressive and permanent degenerative changes within the joint are called immobilisation degeneration, or ID. This existence of immobilisation degeneration is now supported by decades of multi disciplinary research. It's not some newly concocted chiropractic theory and, what's more, forms the basis of many orthopaedic protocols. For example, after knee surgery, the surgeon usually requires that thejoint immediately be placed in motion. Stunning new orthopaedic research confirming chiropractic ideas can be found at the knee joint distraction page below. These proven cellular changes caused by the chiropractic subluxation, give it another name if you please, are detected by noci receptors within the degenerating joint. They start bombarding the spinal cord with noxious neurological impulses, only 10 percent of which are registered in the brain as pain. The remaining 90 have a proven effect on the sympathetic nervous system seriously adversely the whole body, and especially the arterial blood supply to the organs. Now for a bit of neurology; ever wonder why people shake their hand after they jam their fingers in a car door? Or rub their head after they bump it? Mechano receptors in the tissues send important messages to the brain enabling it to coordinate movement. At the same time, these mechanoreceptors send messages to the spinal cord inhibiting noxious bombardment from nociceptors reducing both the pain perceived in the brain, and the noxious stimulation of the nervous system. So, shaking your hand, and rubbing a sore spot stimulates mechanoreceptors which in turn send important messages inhibiting pain. Chiropractic subluxation concept is accredited to the founder of the modern profession, DD Palmer. Knee joint distraction helps the subluxated knee cartilage to heal. At a micro level, movement of a joint keeps it healthy, by stimulating the movement of fluids which bathe the joint cartilage. Simultaneously, as stated these mechanoreceptors bombard the spinal cord with impulses inhibiting any pain messages that are being received from nociceptors. Conversely, chiropractic subluxations very quickly cause degeneration of that selfsame joint cartilage, causing nociceptors to fire off barrages of noxious impulses. Simultaneously, the mechanoreceptors that should be inhibiting those noxious impulses, are themselves inhibited by the fixation within the joint. The net result is a double whammy of progressive degeneration and pain. Can the most common form of arthritis, osteoarthritis, be prevented or at least moderated with Chiropractic help? We believe so. More difficult conceptually is the joint that is too mobile. This occurs in folk with congenitally lax ligaments and is considered by many authorities to be normal. Some can easily touch their toes, others not. But hypermobility occurs also in a joint in which the ligaments or disc have been severely injured or stretched allowing increased movement. Whiplash or sprained ankle, for example. Too much chiropractic manipulation has never been defined, but as a rule of thumb I personally believe that adjustment of a joint more than 25 times in a year is too much. And that may be far too high, but it's simply an opinion. Self manipulation is a serious problem. Some people begin to pop their own joints regularly, sometimes ten or more times in a day. It makes no sense to adjust an already too mobile joint, further increasing the mobility. In the case of self manipulation of the cervical spine, without simultaneous joint distraction, rapid spinal degeneration and nerve impingement is the frequent result. So, in short spinal fixations, really just another name for a chiropractic subluxation, are one of the primary causes of degenerative change and a soup of chemicals in and around the nerves causing pain and tingling in arms and hands and feet. To believe anything, anywhere, at any time on insufficient evidence is a moral wrong. Can dysplasia occur in other joints, including the spine? I believe so. Ask any chiropractor and you will be told that s/he would expect a better outcome in the patient with fixations (hypOmobility) than in the patient with hypERmobility. There is a worrying new trend in which non-chiropractors are using chiropractic terminology. Can a physiotherapist give a "Chiropractic adjustment"? A patient of mine was warned by her neurosurgeon not to risk consulting a chiropractor after a physiotherapist caused a pinched nerve in the neck by giving a "chiropractic manipulation" for a subluxation. Subluxation? Fixation? Spinal Dysfunction? Hypermobility? JULIET: 'Tis but thy name that is my enemy; Thou art thyself, though not a Montague. What's Montague? It is nor hand, nor foot, nor arm, nor face, nor any other part belonging to a man. O, be some other name! So Romeo would, were he not Romeo call'd, retain that dear perfection which he owes without that title. Romeo, doff thy name, and for that name which is no part of thee, take all myself. "We (chiropractors) lack cultural authority." When we continue to tout the subluxation to those who are trained in the medical model, this term is foreign to them, not rational and not understandable. Rather than referring to the "s" word, I would reference the lesion as spinal dysfunction or other terms understandable to them. Most people in sports injury management care most about what can we do to help their athlete achieve his or her maximum potential. The athletes have a unique mindset; they simply want to be well now! My discovery early on was that the health care team must speak with a common language. For us as a profession, and ordinary chiropractors on the ground it is heartening that there is a growing body of evidence, from both within and outside the discipline, that supports many of chiropractic's basic concepts, including the Chiropractic Subluxation. Evidence which now proves that spinal joint fixation can and does lead to significant health problems becomes more compelling as more is learned. Whilst Chiropractic necessarily has a strong neurological and orthopaedic bias, healthy joints are also totally dependent on good nutrition and muscle and joint rehab. The HYALINE CARTILAGE lining the articular processes requires plenty of nutrients and oxygen (having no blood supply of its own). Thus Chiropractic also has a strong nutritional bias. The omega-3 in FISH OIL has been shown to be particularly effective in healing arthritic joints and a generally healthy diet is vital. Green bean and lentil soup makes a low cholesterol, high vegetable protein meal. Upper leg, thigh and groin pain is often from a long ignored subluxation.